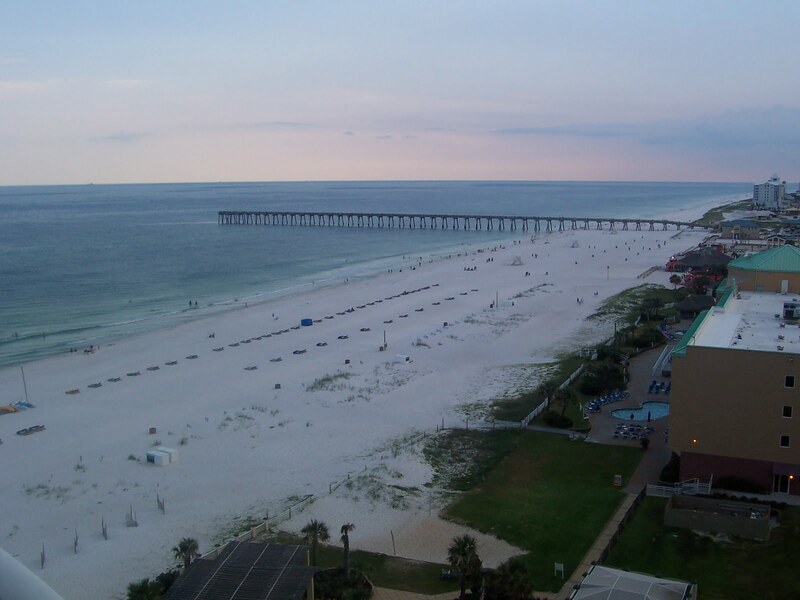 A week and a half ago, this was the view from our hotel room (compliments of my big sister, booked weeks before the Deep Water Horizon explosion) on Pensacola Beach. Beautiful, except for a slight tea colored staining along the water line. My children and nephews played in the sand, well above possible contamination. And blessed be the hotel’s pools! But the oil has been gushing for over two months. Response is slow. Lack of nationwide support is disheartening. It might be a political statement from those with the power and money. 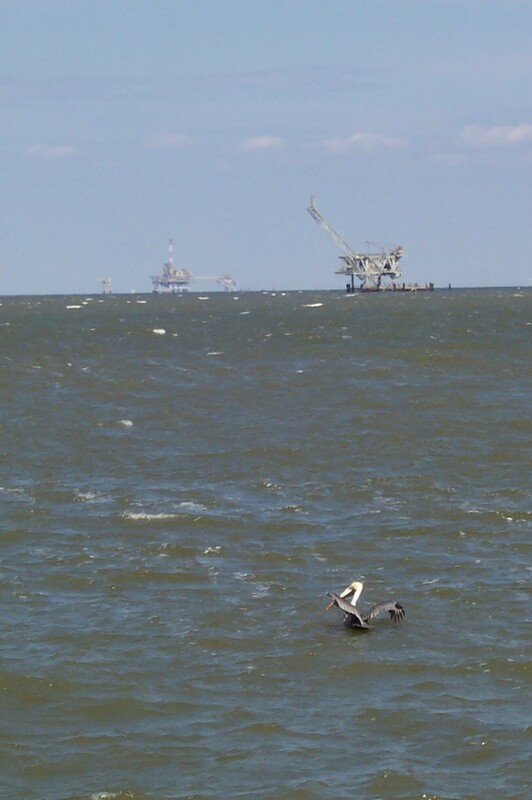 It might be a way to show the evils of offshore drilling, by slowing the response to create prolonged damage. It might be a control game between public and private and government sectors. Heck, the oil rig might have been blown up by an enemy sub! I don’t know. But I do know our waters, our land, the creatures, and even the people who call this section of earth home are suffering. Pensacola Beach had clumpy, brown oil washing on shore for several hours. Miles of scenic beaches are now splattered with sticky grime, much more difficult to clean than the previous tar balls. No skimmers were spotted from the shore and the state government admonished the federal government to send more skimmers to protect the coast of Florida. There are only a few skimmers covering the whole state—if you call that “covering”. Four dolphins washed ashore off Pensacola Beach yesterday. Three were successfully placed back in the water but the forth, oil clinging to its side and face, didn’t survive. It made crying sounds and the rest of the pod—believed to be the dolphins who swim by Fort Pickens every morning—were jumping out of the water, trying to communicate with their lost member. A family vacationing from Arkansas, as well as other bystanders, were the unsung heroes. They shed their own tears as they worked to scrap off what oil they could with their bare hands. It’s difficult enough to explain to a four year old that the gulf water is dirty and we can’t play in it or build castles with the moist, easily shaped sand… but to witness the death of an innocent creature is an unforgettable teaching experience I hope to never encounter. Bayley’s Seafood, opened in 1947, is a landmark near Mobile Bay. I’m not even local but I know it’s practically historic in nature among the true seafood eateries of L.A. (That’s Lower Alabama, not Los Angeles or Louisiana. I’ve learnt me somethin’ down here!) My family passes Bayley’s every time we drive to Dauphin Island. Their recipes are award winning but the owners are speaking out that they might have to close. Every week there is less fresh seafood to be bought. Less items to sell to customers. A local charter boat captain—a husband and father—committed suicide on his boat and it is speculated at this time that his worries over the oil spill (dare we assume the fact that he wasn’t able to run his business as normal had anything to do with it?) were the catalyst. These examples were taken from the first ten minutes of News 5 Wednesday night. Multiply these stories—and all those in the weeks before—by the unnumbered days that the oil will still be gushing. And then, again, by the time it takes the free floating oil to be collected, or washed up on the sugar white sand beaches of the gulf coast. Only then can we accumulate an idea of how catastrophic this is for our earth. For our wildlife. For our economy. For our health. For our children’s children. This morning frost covered the grass and the bird baths were iced over- up to 1/8 of an inch around the rim. All the other cold nights this month only produced some frost on the rooftops. There was even a glittering layer of ice crystals on the canvas of the folding chair on the front porch. I enjoy the winter while I can… it goes so quickly here, if it decides to visit. I put the title in quotes because I’m mentally signing that song. Mentally, so as not to create noise pollution. Wouldn’t it be nice to get a whole new wardrobe every month? To pass on the discarded clothes to others and refill the drawers and hanging spaces in your room with a complete new assortment of adorable, and sometimes even trendy, outfits. Such is the life of Princess S. She turns four months this week and each month I have to bump her wardrobe up to the next size. At birth she wore (filled out in most cases) 0-3 and 3 month clothing. At one month she was wearing 3-6 months. At two months it was 6 months. At three months she wore 6-9 months. Now, she’s on to 9 and even some 12 months (depending on the cut- she has a long torso).